Oh stop rolling your eyes. You all knew I was going to get to her eventually..
As I posted on the last forum, Linda has been getting high praise for her role in Gigi. Has anyone had the chance to see the play? A while back she had stated she was working on a book. Has anything more been said about it? You do know that if it does get published in the UK, you all are mandated to rush out, buy a copy and send it to me. Where is she performing in 'Gigi'? ok,ok, all kidding aside...I think the years have been kind to her, not only in her role as Tara, but certainly in her post Tara career...As the years roll by, Fans, both old and new to her era, have either embraced her as Tara, or Have re thought Tara/Linda...I tend not to be so harsh on her, as I was in years past..Nowdays, I think she wasn't bad...and given the same meaty scripts that Blackman and Rigg had, Thorson might have held her own..and perhaps Tara King wouldn't be getting slagged by so many Fans.. I recently watched Linda in an Star Trek episode...she was good.. I heard she was working on her biography, but no news on that since. One would hope it'd get a Canadian release since she's probably fairly well-known after her Avengers and Emily of New Moon stints, and her son is going to U of T, so she still seems to have some connections to Canada. It'd be fun to read a Linda bio. Honor should pen one as well. I would think it would be released in Canada for the reasons you state. It also could very well be released here since I understand she has obtained U.S. citizenship. I just think it would be an interesting read. Too bad Diana Rigg is against writing her own autobiograpy. Imagine the stories she could tell! Thanks Kim! Then, I may go! But the weather is awful at the moment! AS should the Dame! But, she won't! But, you never know. She said she would never get married at one point and she is now twice-divorced! By whom? Linda or Honor? Either way, I'll definitely be getting it on import if I have to. No different than anything else I order from across the pond. They ought to set up a customs desk next to my mailbox. I buy a fair few R1 DVDs so that balances things out a little! For a second there I thought you had some inside info about Honor writing a bio as well. Two at once. That'd be a treat. I've only just added region 2 DVDs to my overseas shopping. Ironically, things get here faster from Britain than the States! Makes the whole "region" situation seem a bit pointless, really, doesn't it? I really hate it. CDs are multi region, so why DVDs! Grr. It's pointless. If they're willing to sell DVDs to other regions, what purpose are they serving? They're not protecting the DVD market. And anyway, 99% of what I buy isn't available in region 1, anyway. I knew I had to hack my player when I went to the HMV Megastore in search of new shows to watch. The cry that went up could be heard halfway across the country. "What d'you mean you don't have Adam Adamant Lives!?!" I saw her in Gigi last Monday, and, not being a fan of musicals, I was surprised to find I really enjoyed it. I spoke to Linda after the show. She was lovely and bubbly as always. Oh how wonderful that you got to meet her. She has received rave reviews for her part in the show. How I wish I could see it....oh well, where would we be without dreams? So nice you got to meet her Wiebke. Any chance you took a picture of that? Linda Thorson is a charming lady, who is still happy when we talk to her about The Avengers. She will always be Tara King in our heart. I saw many clips with her, notammly a video in which she plays a woman who's gonna to be raped ! It's a very violent video. I have many documents about her, and I adore the picture of her, taken when she was a 7-year-old girl. (Picture available in THE AVENGERS ANNUAL, 1968). 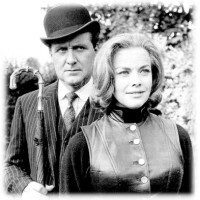 Linda Thorson and Patrick Macnee were given "diet" pills to help them both lose weight for the series. Linda seems to have gained some weight in the second season (or is it just my imagination?). Does anyone know if they were given the drugs prior or during the first season? If they were given prior or during, it could explain why Linda may have been difficult to work with during those first few weeks. Those were some horrifyingly wicked drugs they were given.